Each scene slams into us like shrapnel: overlapping intelligent dialogue, fever pitch arguments, soul-breaking philosophies, walk-and-talk business decisions, with flashbacks as savage as the writing, smash-cut into the smallest interstices, rather than drawn-out exposition. After viewing STEVE JOBS, you will log into your personal media device that Steve Jobs invented, and blog that you are exhausted. 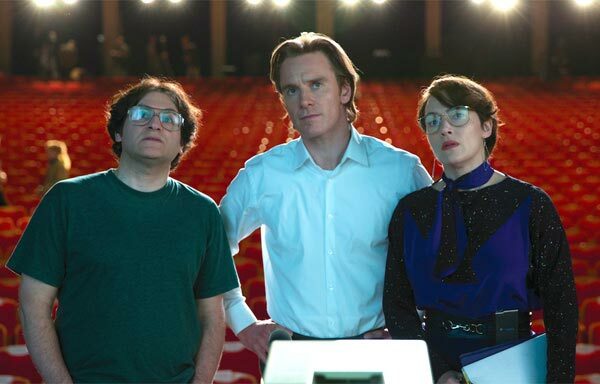 Unlike most biopics about Steve Jobs, which focus on his ruthlessness as co-founder and CEO of Apple Computers and never explore why, the movie STEVE JOBS teases out a throughline of a man battling to understand familial bonds. Maybe too neatly, because from all accounts, Jobs was driven by more than just one demon. — we are thrust into the next scene, where Jobs confronts his ex-girlfriend Chrisann Brennan (Katherine Waterston) asking for financial help, their “daughter” Lisa in tow as ammunition. And as arc of redemption for Jobs, who would start out vehemently denying his paternity to Lisa. Her first interaction with him is as damaged and cruel as you can imagine, when she proudly proclaims, “My daddy named a computer after me,” to which Jobs replies harshly, firstly that he’s not her daddy, and that his LISA computer stands for “Local Integrated Software Architecture” (which, we would discover later, means absolutely nothing). You can’t write code, you’re not an engineer, you’re not a designer, you can’t put a hammer to a nail. I built the circuit board. The graphical interface was stolen from Xerox Parc… So how come ten times in a day, I read Steve Jobs is a genius? What do you DO? 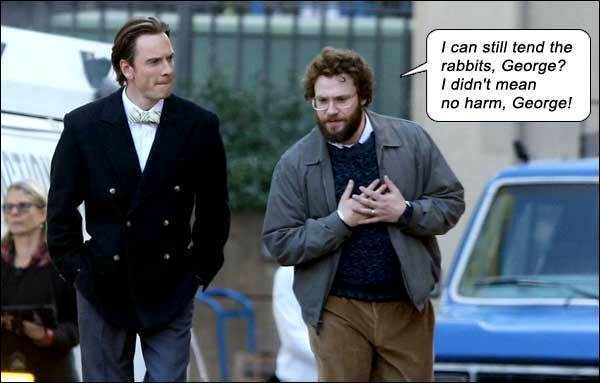 — Seth Rogen as Steve Wozniak, STEVE JOBS. The last character introduced in this bullet-train first act is Jeff Daniels as entrepreneur and CEO, John Sculley. Literally seconds before Jobs must walk onstage, Sculley shares a rare wine with him and exposits on Jobs being adopted; we also sense Sculley fulfills the role of surrogate father to Jobs. Or a sinister Svengali. Stitched together with montages, the three acts are built around three launches of revolutionary computer products, career defining moments, camera tailing Jobs relentlessly before each launch as he damage-controls his staff, his product, his ex-colleagues, his assistant and his informal family. Act II, 1988. NeXT computer launch. Again, moments before showtime, crisis mode; more revelations, as Sculley visits Jobs in a hail of shouted explanations that leave us unsure of everything we thought we knew about the ousting of Steve Jobs at Apple. One revelation for me in this movie is that Jobs wanted to make his computers “closed systems” while Woz, Sculley and most of his techs advised for compatibility with other computers. In a flashback boardroom decision that is too cinematic for its own popcorn, Jobs is victim to a show of hands while it buckets rain outside the giant corporate windows. Act III, 1998. iMac launch. It didn’t really matter whether we were paying attention to all the tech jargon, the political wrangling or the triumphs and trials of Jobs trying to stage his marvels, this story resolves here with Lisa Brennan-Jobs, now 19 (Perla Haney-Jardine; she was Bill’s daughter B.B. in KILL BILL VOL.2). This man, so intent on fixing things for maximum efficiency, would admit to Lisa, “I am poorly made.” Arc resolved. No need to show further glories, no need to show further head-butting, no need to show untimely death. This emotional core is what STEVE JOBS was aiming for. A man achieving a great goal, a “connection” without the necessity of a USB cable. The three people responsible for what you’re doing RIGHT NOW. Nerd Against Geek: It might seem Wozniak’s constant upbraiding might have led to Jobs’ redemption, “It’s not binary – you can be decent and gifted at the same time.” But woz it? (Dja see what I did there?) The indispensable Hoffman got to the point where she threatened to quit as his P.A. if he didn’t “fix this now” with his daughter. So all roads – including Sculley’s musings about Jobs being adopted – lead to this moment. Movie seems to indicate Jobs just needed that reconnection with his estranged daughter to become Saint Steve. So though it takes his abrasiveness to heights unseen in previous Jobs bios, it palliates that unsavoriness with this one event. But we must look past the movie manipulation and ask: Did Jobs actually keep his daughter’s first Mac “painting” and show it to her at a crucial emotional moment when she was 19? Artistic license is a sonuvabitch. Writers: Aaron Sorkin, Walter Isaacson. Starring: Michael Fassbender, Kate Winslet, Seth Rogen, Jeff Daniels, Michael Stuhlbarg, Katherine Waterston, Perla Haney-Jardine, Ripley Sobo, Makenzie Moss, Sarah Snook, John Ortiz, Adam Shapiro, John Steen.